In 2007, the Avon RIGS Group undertook a survey in South Gloucestershire, comparing the boundaries of the RIGS areas with those of the SSSI’s and taking into account the reasons for the designation of the localities in the two categories. One of the localities surveyed was Lower Woods which lies between Wickwar and Hawkesbury Upton, and incorporates parts of Inglestone Common. Lower Woods was designated an SSSI in 1966 (under the 1949 Act) and then in 1985 (under the 1981 Act) because of the biodiversity of the woods and the geological content. The citation notes that they are the most extensive ancient woodland in Avon (as it was then) with boundaries unchanged in 200 years. 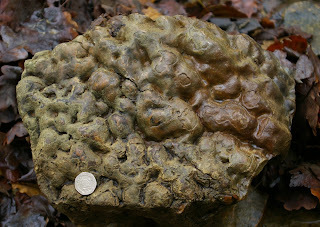 The woods are on the damp clay soils, ranging from acid to mildly calcareous, of the Vale of Berkeley. Oak, Ash and Hazel are the commonest trees with stands of lowland Hazel, Sessile Oak, Valley Alderwood and Ash/Wych-Elm woodland. A large variety of other trees and bushes are listed while the ancient woodland indicator, the Service Tree, is locally abundant. The woods are also noted for the Bluebell, Wood Anemone and many others, including Primrose. The woodland provides habitat for large numbers of small birds, being in past years, an important spring and summer locality for the Nightingale (which sadly, has been absent in the last 2/3 years). It is also rich in invertebrate species, particularly rare butterfly species (Silver Washed Fritillary, Purple Hairstreak). Geologically, the citation records excellent exposures of clays, shales and limestones of the ‘Rhaetic’. Two horizons of the Cotham Member (Cotham Marble) are present and the Liostrea Beds are well developed, all having been recorded by Murchison over 150 years ago. 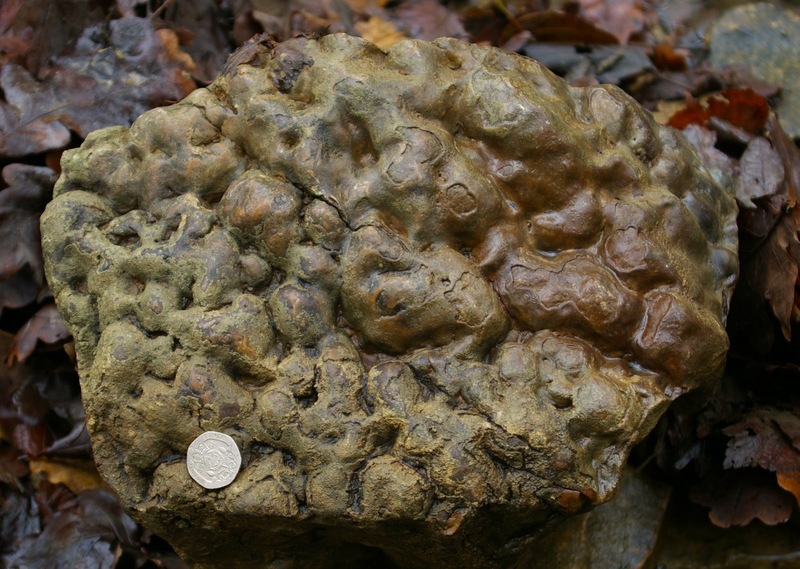 The ‘Rhaetic’ bone bed occurs in the Westbury Member (‘Westbury Beds’) from which an abundant fauna of fossil fish have recorded with sedimentological features important in understanding the formation of the bone beds. The RIGS Group record included the whole of Lower Woods and parts of Inglestone Common so it seemed that the best approach was to survey the whole area, paying particular note of the geological exposures within the woodland. The area of Lower Woods is large, covering 692 acres (280 hectares) and is notoriously muddy and rarely dries out – a feature controlled by the Liassic and Triassic clays which underlie the woodland causing lengthy and sometimes slow progress! However, there are no exposures away from the edges of the Little Avon River and its tributaries which run through the woodland so the review of the RIGS record was confined to the watercourses, starting just upstream of the footbridge where the river runs through from the east side of the wood. 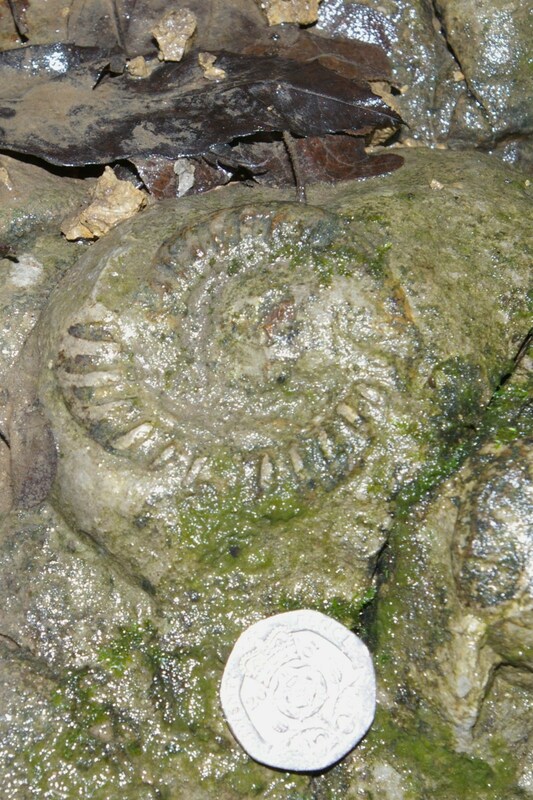 Here, lowest Jurassic (Lias) limestones are exposed, both in the main river and the tributary running in from the north, with ammonites and Ostrea spp. found on some surfaces. By the footbridge, the same limestone benches line the banks, under which are loose pieces of the Cotham Member, easily recognised by the mammillated surfaces. Downstream, on a beach formed by a bend in the river, many rounded limestone pebbles, blocks of Cotham Member, abraded Gryphaea and other bivalves are common. Some distance further downstream, grey/black flat blocks of the Westbury Member lie in the river bed although no evidence of the Bone Bed was found in spite of it being recorded at this locality. (On a later visit not associated with the RIGS survey, a vertebra (Icthyosaurus?) was found at this same point!) A short distance downstream the Blue Anchor Formation (‘Tea Green Marls’) become exposed in the river bank and further down, Mercia Mudstone predominates. The comparison of the SSSI and RIGS boundaries, which were at the time, almost exactly the same, highlighted the fact that the latter was embracing a large area of non-geological interest. At a RIGS Group designation meeting, the decision was made to redraw the RIGS boundary, incorporating only the river and its immediate banks and beaches. Lower Woods is a delightful place at all seasons because of the diversity of birds, flowers, trees and insects that can be seen and heard. 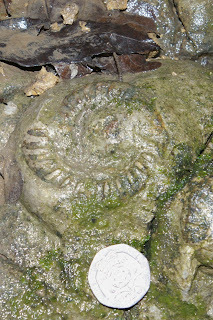 For the geologist, the river provides in a relatively short distance, lowest Jurassic limestones and fossils overlying a variety of easily accessible Triassic exposures. There is also a trail leaflet which can be collected from the car park area near the woodland centre.